is written and performed by Vickie Tanner and directed by Bruce McCarty and Padraic Lillis. 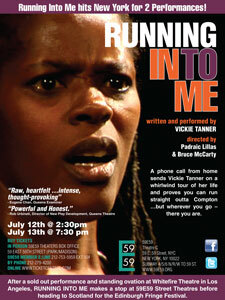 It is a solo play about a young person’s struggle to overcome internal and environmental obstacles. It is deeply inspired by my own experiences growing up in a dysfunctional, crime-ridden section of South Central Los Angeles and my work with young people as a teaching artist in New York. Recently: BEAT Festival @ the Brooklyn Conservatory of Music, Brooklyn Museum and Nubox theatre 2016. 59E59 Theaters, LaMama, Nuyorican Poets Cafe, United Solo Festival /Studio Theatre@Theatre Row, Cherry Lane Studio Theatre, Dixon Place Theatre, Queen’s Theatre in the Park, 78th street theatre, the Lark Play Development Center and Whitefire Theatre in Los Angeles and the Edinburgh Fringe Festival in Scotland. 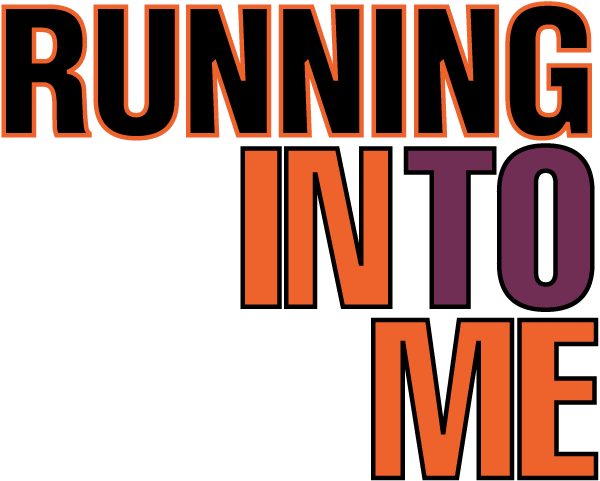 Running Into Me regionally and in school environments: Skidmore College, Union College, The Dublin School, NH, Brooklyn Youth Company, John Sayles school of the arts, 52nd Street Project and The Kitchen Theatre in Ithaca, NY.